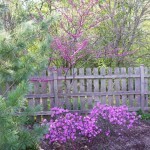 Last post, I talked about how I made a mistake by planting a redbud with PJM rhododendrons. The mistake was a lack of color contrast. Today, I am going to write about one spot in the garden where I have made a LOT of mistakes. The 1st Mistake: Planting a Rocky Mountain juniper! The first mistake I made in this spot was planting a ‘Tolleson’s Green Weeping’ Rocky Mountain Juniper (Juniperus scopulorum ‘Tolleson’s Green Weeping’). Oh God what was I thinking? That weeping juniper was actually a pretty cool looking plant…in the pictures in the books! Mine was a stick of foliage that could not stand up straight in the wind. The rootball and trunk were way too small for the height of the tree and I didn’t have the sense to radically shorten it to keep it from falling over repeatedly. Hey it wasn’t me, it’s that tree! Really! The biggest mistake about planting this tree however was the fact Rocky Mountain junipers smell like cat pee. This might be OK if I planted it far away from my patio. But the 20 feet was not far enough for my wife’s nose. Well anyways, I came to my senses and removed that tree and planted an Arnold’s Promise witchhazel (Hamamelis x intermedia ‘Arnold Promise’). This tree looked to be a winner. The first fall after I planted it, it had fabulous fall color. Red, orange, and yellow all on one leaf. 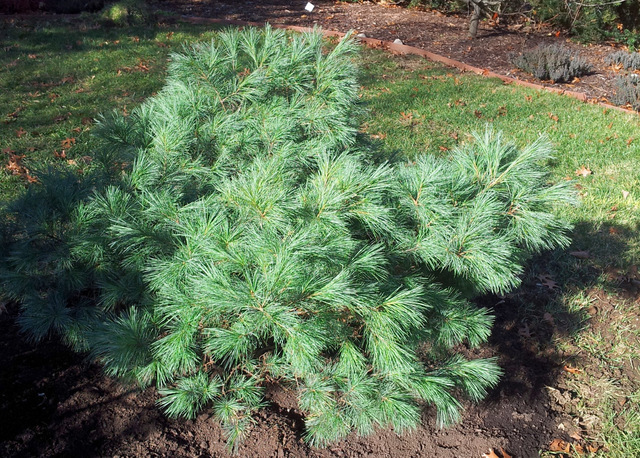 Sometime after that, I found a dwarf White pine (Pinus strobus ‘Blue Shag’) on sale at one of my local nurseries. At this time I was trying at the time to add winter interest to the Northern side of my yard. 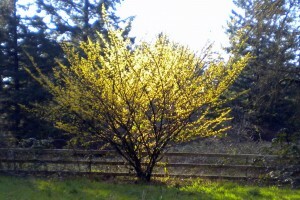 There was also an open space in front of my yew hedge next to the witch hazel I had just put in. So in it went. I thought the dwarf white pine with the yellow flowers of the witch hazel in front of the yew hedge would provide a nice scene in the winter. I actually was kind of eager for winter to come so I could see how this grouping would look when the witch hazel flowers emerged. February came and went. No flowers. March came and went. No flowers. April came and went. No flowers or leaves. May came and went. No flowers or leaves or signs of life! 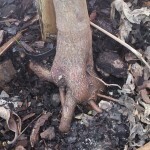 The witch hazel did not make it. I dug it up to do the autopsy. 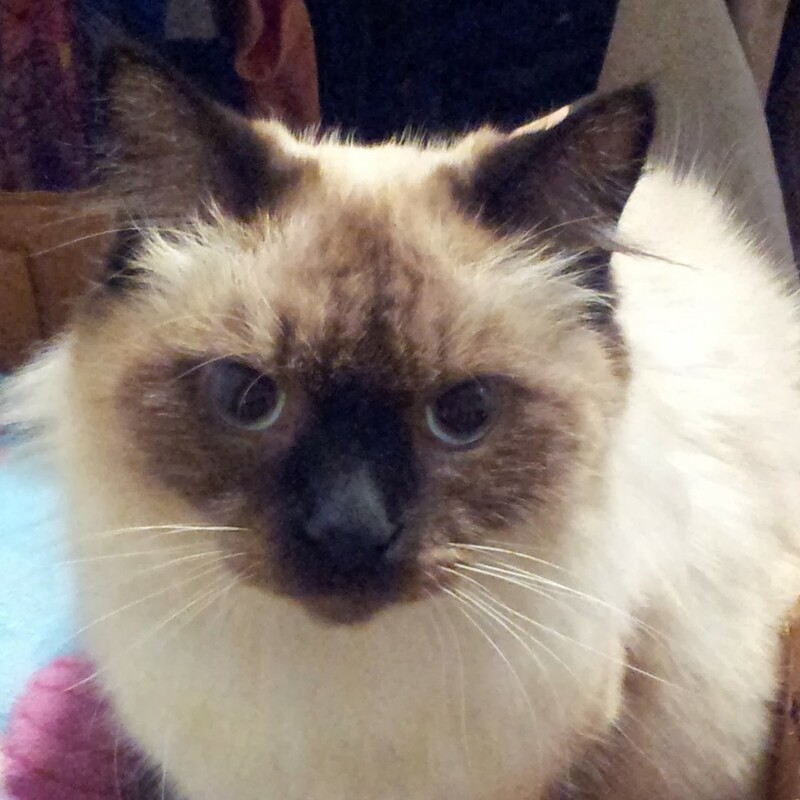 It turned out that the root ball I so carefully planted was entirely sand. I did not know this back then, but when you plant a root ball that is mostly sand into soil that is mostly clay you have a problem. The problem is the water gets sucked out of the root ball quicker then you can put it down. Sure I watered it regularly after I planted it, but not frequently enough for a root ball made of sand! My next replacement plant for this area would have to be cheap. I was not sinking money into another expensive plant here. This time I went for a $25 white pine from a big box store. 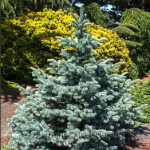 I thought that a green pine that looked similar to my four bluish green Vanderwolf limber pines in the back of my yard would make my yard appear bigger. You see cool colors such as bluish green tend to recede into the background when compared to normal green. 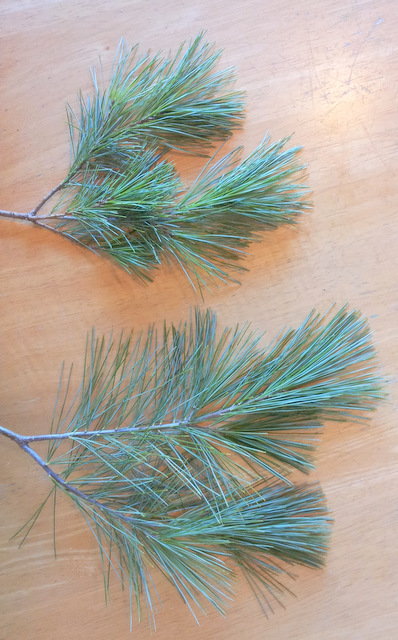 Thus the bluish colored pines at the back of the yard appear to recede when seen with the normal green color of the white pine. Thus making the yard seem larger than it is. 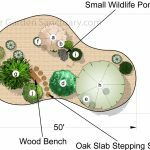 This concept was one I first read about in a fine little Ortho book on Japanese Gardens years ago. 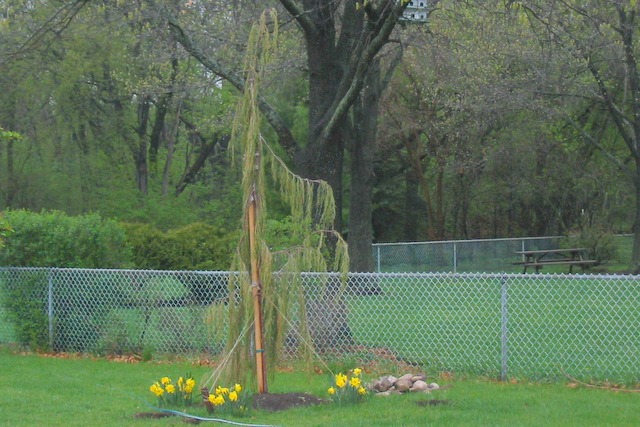 I also thought my new white pine would look nice next to its smaller mounded ‘Blue Shag’ brother. The forms and slight color difference would make for interesting combination. It did for a while. Then they both grew and their forms became less distinct as they grew together. It turns out they were planted too close to each other. The fine foliage texture of these two white pines just kind of blurred together now. The color difference was not distinct enough to help you see two separate plants either. This is just another example of two plants not having enough contrast to stand out as being different or interesting.